The World Cup starts today, and this interactive visual shows you all the important numbers. It starts with international soccer/football rankings from The Power Rank. This method takes the scores in games and adjusts for strength of schedule. The Power Rank can not only rank teams but also offense and defense. These rankings feed a simulator that plays the World Cup 10,000 times. By counting the number of times an event happens, like the United States finishes 2nd in Group G, we obtain the probabilities for certain events. For more details on my methods, click here. Unlike most sites, we don’t want you to go blind reading these numbers in a table. 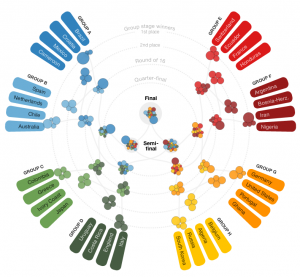 In collaboration with Andrew Phillips at Chartball, we created this interactive visual with World Cup probabilities. Hover over a team name to see the odds that they advance through the stages of the competition. The group of circles closest to the team name corresponds to the probability of winning the group. The next closest circles correspond to second place. For the round of 16, a team can enter this stage of the competition via two routes: winning the group and placing second in the group. Hence, each team has two probabilities for the round of 16. The gray lines show which circles correspond to which scenario. Each team also has two probabilities for the quarter and semi-finals for the same reason. Hover over the circles at any stage of the competition to see the corresponding team. The visual will be updated each night after the games. The rankings used for the visual consider the last 12 years of international play. Research by others has shown that these rankings are as accurate as rankings that consider the last 4 years of play. However, these rankings tend to underestimate up and coming teams like Belgium, a team that suddenly has stars on major European club teams. While my rankings have them at 41st, they’re more likely a top 20 team. The visual has Russia as the top team to win Group H at 42%. However, I’m probably underestimating Belgium’s chances at 24%.